My then-girlfriend Nada, a true angel in my life, noticed how excited I was about these elfin aliens, and had begun devising a sneaky, mischievous, and super-loving plan to find me one. She was also someone who stood up against abuse — to people and animals — and soon had rescued an abused doberman and delivered her to my doorstep. From her teeth and behavior, she was estimated to be around one and a half years old. We decided to name her Sadie. With a little legal finagling, we were even able to get her AKC papers. Yep, the vet had guessed her age really well. So by Spring break, I had already had Sadie for about two months. So we packed not one, but two dobermans up in the back of Nada’s car, and headed for South Miami. It was a long, action-packed adventure, from Central Illinois to South Florida. The dogs got along royally, and we just needed to make the occasional doggy pit-stops along the way. The first night we checked in at a hotel in Chattanooga, Tennessee, after looking for pet-friendly hotels for hours. This one wasn’t, and we checked in without telling them about the dogs. We requested a room as far away from the maddening crowds as possible, suggesting, through our loving embrace, that we needed some honeymoon-like privacy. The concierge winked her tacit approval, and we hurried off to our room. When the smoke cleared, we took the doggies into the bushes, they did their after-hours entrepreneurial business, and we ushered them into a beautiful suite for the night. They slept side-by-side on a sumptuous sofa, and we snuggled ourselves to sleep on a king-size, pillow-top cloud. The dogs made it through the night without so much as a peep. We jumped up early, before the morning had yet blushed beneath sweet whispers from the night, to sneak the dogs out and hit the road again. We decided to drive the rest of the way without stopping at another hotel. Both dogs did fabulously, alternating between sitting up and looking around, and curling up like little deer and snoozing on the big back seat. When we got there, we spent some time at my cousin’s Coral Gables condo, and then packed up a tent and went camping in the Keys. Again, both dogs were awesome, got along like old buddies, complied with our every request, and seemed to be enjoying themselves immensely! Whether walking beside us in downtown Coral Gables, swimming with us in the ocean shallows, or hiking in Key Largo’s John Pennekamp Coral Reef State Park; these dogs were solid! And there was something about them that magnetized my interest. They were so cool, unique, powerful, sensitive, and sweet. They craved human contact, and only wanted to be close to their people. They were natural protectors, and helped us feel safe in risky situations. Needless to say, Spring break was amazing, and my appreciation for the breed was growing by furry leaps and bounds! 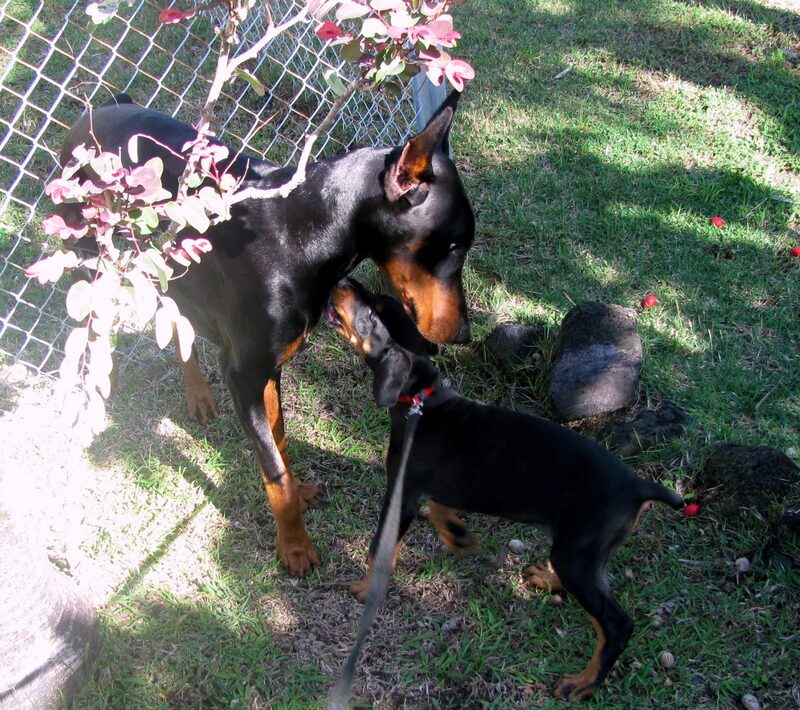 These were my earliest experiences with dobermans, and I now have Malu and Leʻa, my sixth and seventh. So there was Sadie, then her daughter Fille (French for daughter), Fawna, Mr. Worf, Pono, Malu (Hawaiian for peaceful) and Leʻa (Hawaiian for joyful). Malu is now eight, and Leʻa is almost seven. And, you guessed it, following their Spring fling Chism and Sadie hooked up and, voila, out popped seven gorgeous, healthy puppies (six girls, and one boy)! I managed to responsibly care for Sadie during her pregnancy and raise these magical little creatures for the first 8-10 weeks of their lives, while living in an apartment that didn’t allow pets and supposedly attending college. 😉 It was a real education, and strengthened my love for these noble, gentle creatures. And, yes, Ernie and I had planned for the breeding. So, aside from the anatomical and physiological differences, and the over-rated cognitive, communicational, and emotional features afforded us by the human brain; just what is it, on a spiritual level, that separates us from other animals? Yeah, it depends on where we choose to focus, and how deep we choose to go. Sometimes the human brain is the greatest deterrent to spiritual awareness. 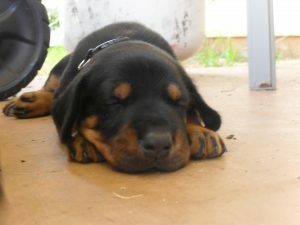 We could learn to let go of fear, unhappiness, doubt, and stress by becoming more like a tree, the wind, or a doberman. They don’t worry about stuff, they just are. They live and do what they can do to manifest their purpose until they can’t do it anymore. Sure, dogs might seem preoccupied with toys, or other things, but this is from joy, or maybe habit, but there is no worry involved. If they are around stressed out people long enough, they can become conditioned to stress too; but this is not a natural state for them. That’s right, it’s not a natural state for us either. Our natural “feeling” states include awareness of love, joy, and peace flowing from universal consciousness through our spirit into human consciousness; along with instinct-generated emotions supporting the fight, flight, or freeze responses of Survival Mode (e.g. anger, fear, hopelessness). Many in the pet industry now say that dogs have “anxiety,” but I disagree. Anxiety is irrational fear. Dogs are not capable of being irrational. So I see these symptoms as being conditioned forms of fear. The dogs experience fear in general, or in specific situations, and become conditioned to feel fear. Just like Pavlov’s dogs with a bell triggering salivation, any dog can be conditioned to be afraid of something that has been scary (e.g. raised hand, loud voice, fireworks, thunder and lightning, etc.). This is just their survival instinct in action. Let’s not concoct the same neurosis in other animals that we have fabricated for ourselves. Remember, such feelings are not a natural state in people either, unless our lives are in danger. Sometimes it seems like we humans construct problems so we can play God and solve them, or so we can build a profession for ourselves around them (e.g. therapy, pharmaceuticals, nutraceuticals, target marketing, etc.). Which are the most commonly prescribed drugs in America? Psychiatric medications. What are the third and fourth leading causes of death in the U.S.? Traditional medical treatment and pharmaceuticals, respectively. Negative emotions, for people, are intended to occur only when we are under an eminent threat to life. The anger, fear, or hopelessness we might experience when in danger, was designed to motivate us to fight, run away, or freeze with fear, respectively, to save our lives. In the absence of such a threat, we are not supposed to be feeling negative emotions. It is only the human ego, through its parasitic struggle to maintain itself, that we are tricked into believing that there is a threat to react to with negativity. The “threat” is not to our lives, but rather to the ego’s existence, and to our illusion of power and control, which has been associated, through egoic conditioning, with a struggle for survival. The ego feeds off negativity. This is what keeps it alive. So the survival instinct of negative emotions was expanded, by the ego, to sustain itself by tricking us into believing that there is a “threat” related to our appearance, intelligence, worthiness, perceived need for more, power over others, acceptance by others, sense of unfairness, perceived need to be right, inability to trust, and unwillingness to take responsibility for our mistakes. Although important considerations for our healing and growth, none of these represent eminent threats to our lives. And, although clearly sentient, such neurosis-generating preoccupations don’t sound very evolutionary to me. The human mind was intended to help us interpret higher things, not to create and strengthen lower things. I believe that all living things are sentient, and may hold a broader view of what constitutes “living things” than some. I believe that all things created from subatomic light vibrations, the sevenfold vibrations of light and life, the conscious infinite light of the universe; are sentient living things. I believe this because they are part of universal consciousness, and are interconnected with the oneness of it all. They exchange the same flow of energy and information we do. Whether or not they can interpret and communicate what they perceive, like we do, is, for me, irrelevant. If a rock, like a quartz crystal, stores, amplifies, and transfers loving vibrations from the universe; is its awareness of this energy less valuable than ours (if we have any awareness of it at all)? Is its mineral form, molecular structure, atomic energy, or subatomic light vibration less alive, or less sentient than ours? The conscious infinite light it is created from, and the energy and information flowing through and from its creation, is the same as that which forms and flows from ours. David Frawley, in “The Yoga of Herbs,” further illuminates this idea. He says, in a section entitled THE MANIFESTATION OF CONSCIOUSNESS INTO PLANTS, “Evolution is a manifestation of latent potentials. Within each thing is contained all things. In the seed is the tree; in the tree is the forest. Therefore, intelligence is contained implicitly in the many worlds of nature, not only in our human-centered world. Another way of saying this is that consciousness exists in all forms of life. It is the very basis of creation, the power of evolution. Life, creation, and evolution are the stages in the unfoldment of consciousness. There is nothing in existence that is unfeeling, nothing that is profane or unspiritual, nothing without a unique value in the cosmos. Life is relational, interdependent, interconnective, a system of mutual nourishment and care, not only physically, but also psychologically and spiritually. Consciousness, therefore, is not merely thought, much less intellect or reason. It is the feeling of being alive and being related to all life. Consciousness as pure feeling exists already in the plant and is hidden in the rock, even within the atom itself. Elemental attraction and repulsion are similar to love and hate, like and dislike. For this reason, the ancient seers of India held that the Self alone exists, that unity is the basis of all existence–that the unity of life is the unity of consciousness. So from this and other perspectives, pets are people too. Leʻa started developing some weakness in her lower back about two months ago. It seemed minor, and through limiting her activity, and gently massaging in some magnesium or arnica oil, she returned to her normal, joyful self. She is a super-sports dog, a champion goalie, and has always lived to play her toy game. Aside from an occasional sore front paw, from overdoing it a little, she has been the epitome of health, happiness, and strength. She weighs 90 pounds, and is built like a football player dog. She has beautiful, big floppy ears, and a silky soft chest and belly. Because of her broader build, we have sometimes referred to her as “our little love bear.” Since she was a puppy, I have been giving her glucosamine chondroitin, vitamin C, and cranberry supplements each day (glucosamine for joint health, and the other two for a high bladder PH issue). She will be seven on November 13. On September 11, she began losing urinary continence during her sleep. Her urinalysis came back normal (no infection, no crystals, etc.). So I started getting up once or twice each night to take her outside to pee. During this same week, her lower back weakness returned. We began limiting her activity further, and started her on Previcox, a non-steroidal anti-inflammatory commonly used for doggy arthritis. This helped tremendously, and that challenge again became limiting her activity. I’m not sure if she regained control over her bladder, or if it was just due to me never letting her go for more than four or five hours without peeing; but most of the incontinence had also stopped. And then something else started happening. During the week of October 1, she started seeming pretty sore. So I restarted the Previcox. This helped a lot, but when I took her off of it, the soreness came back. Sometimes, after walking around in the yard to conduct her personal business, she would just stand still, like she was frozen in place, until my wife or I would gently usher her to her bed or crate. After talking with my two vets about it, we decided to take her in for x-rays and blood work. There were hypotheses of kidney or urinary stones, kidney or liver disease, hip dysplasia/degenerative joint disease/arthritis, any cause spinal injury or disease, caudal equal syndrome, cancer, arthritis, and cervical spondylomyelopathy. But it is important to understand that, while she was taking the Previcox, she still had her normal appetite, strength, mobility, vitality, and seemed her normal self. In all my years as a doberman owner I had never heard of cervical spondylomyelopathy (CSM), or Wobbler Syndrome. Except for Sadie and Fille’s reproductive system cancer, which was successfully treated with surgery, my dogs were super healthy and strong. CSM is caused by an instability in the vertebrae in the neck, which creates lesions in the spinal cord. When the neck bends up, down, or sideways, the unstable, floating disks or thickened ligaments squeeze, or cut into the spinal cord. One of the first signs is a weakened lower back. A simple home test for it is to gently lift up a back leg, supporting it above the foot, turn the toes under, and then set the dogs foot down on the turned under toes. If the dog stands on the knuckled under toes, without immediately flipping them back out to self-correct, then this points to CSM (or another spinal/neurological issue). So I started performing this test, and Leʻa regularly flipped her toes out and refused to stand on her knuckled under toes. But one night, when she seemed particularly tired, she did stand on her right back foot with the toes knuckled under for approximately 45 seconds before struggling to flip them out again. And then she did it with her other back foot. The only way to confirm CSM is by taking x-rays, CT scans, or MRIs of the neck in three positions (straight, hyper-flexed, and hyper-extended). The vet claiming to have the most experience with this condition said that, after being diagnosed, dogs usually have between three months and one year to live. On October 5 we took her in for the x-rays and blood work. Her blood work, covering 26 different organs and systems, confirmed that everything was within the normal range. The x-rays, covering her hips, spine, and neck, showed that she did not have hip dysplasia, although the range of motion in her hips was limited, especially her right one. The x-rays, according to this vet, also confirmed that she has CSM. The interesting thing about this is that, the first thing he did when we walked into his clinic was perform the proprioception-assessing knuckle-under toe test, and all of her toes instantly popped back out; so he said that she did not have CSM. We started wondering if something happened during those five hours she was at the vet. This vet said CSM usually occurred in dobermans over the age of six, and great danes as young as one. The literature said it could occur in dobermans between the ages of three and nine, and in great danes over the age of three. The literature said it occurred in approximately five percent of dobermans and danes, and much less often in other large and giant dog breeds. The Ohio State School of Veterinary Medicine specializes in CSM. Three sources said that dogs could live up to five years after receiving the diagnosis, and that there was a 50% chance of improvement with medical treatment (anti-inflammatories) and up to 80% with surgery (including cervical vertebral fusion). This would, of course, depend upon how bad the lesions were, and the presence and type of other comorbid (simultaneously occurring) conditions. The initial and immediate treatment recommendations, which we had to discover on our own later by researching it, included limiting activity, intensive doses of steroidal anti-inflammatories for three days, and then a lower dose for the balance of a week (with re-check by vet at this time); and serious muscle relaxants. This vet recommended only the non-steroidal anti-inflammatories we had already been giving her. He said nothing about limiting her activity (which we were already doing), and did not mention steroidal anti-inflammatories or muscle relaxants. When I checked in with the other vet’s office, they also said to just keep her on the Previcox, and that she would probably need it for “the rest of her life.” These were two licensed vets, so I figured that, especially since they both recommended the same thing, they probably knew what they were doing; and that there must be a reason they did not prescribe the standard treatment for this condition per the practice guidelines. We had researched and discovered some herbal supplements that were specially formulated for nerve and joint health. But, since the use of many nutraceuticals was contra-indicated when using prescription anti-inflammatories, and since the anti-inflammatory and analgesic properties of the drug were needed to help her move more easily and prevent pain, we decided to continue using the Previcox and look into surgeries, acupuncture, and other remedies to prevent pain and try to resolve her condition. I called the only naturopathic vet on the Big Island to schedule a consultation. She was over on Oahu dealing with a family crisis, and wouldn’t be able to see Leʻa for about two weeks. Except for the severe pain she suffered following the x-ray process, Leʻa has exhibited no further signs of pain, and has continued taking the Previcox. Her hips have not yet recovered from apparently being forced into positions beyond her range of motion in order to obtain the x-rays (per vet’s account). When she went in she was a fully energized, steam rolling tank; and when she came out, she was a broken, severely weakened invalid that couldn’t even walk on her own. She has not recovered from whatever happened when she was at the vet being x-rayed two weeks ago. October 19: When I started writing this post on October 11, except for the hip instability, lower back weakness, and need for us to support her while she walked, Leʻa was vital, energized, and responsive (with continued Previcox use and limited activity). Last night, even while we provided extra support from a service dog vest, she could not stand, and kept either sitting or lying down. We had gotten her an orthopedic memory foam dog bed that is really low to the floor, with sides all around the perimeter for support, and were able to usher her into her bed. She laid down at about 6 P.M. last night, and has been unable to get up since. I came in to check on her at about 3 A.M. this morning, and decided to stay with her, since it seemed like this might be the last morning we had to spend with our little love bear. It is now about 7 A.M., we have been here for the past four hours, and the most she has been able to do is lift her head. Part of limiting her activity has been keeping her from going upstairs, so we turned our carpeted, air conditioned garage into a comfortable doggy apartment. She usually rushes to us, struggling to eagerly greet us with kisses and her little propeller tail, but today she did not move in her bed. She cannot stand, walk, or control her bladder; and seems generally non-responsive, so we may now be faced with finding someone today to help us help her continue the peaceful sleep she has already begun. When the time arrives, we want to do it here at home, where she is safe, comfortable, and already sleeping. Although there may be multiple issues, this happened really fast! The vet who took the x-rays said that, with this diagnosis, dogs had only three months to one year to live, and the literature said three to five years, and it has been two weeks today since her diagnosis was confirmed. So what happened during those five hours at the vet? I went upstairs to let Malu out and make some coffee, and heard a tapping sound from the garage ceiling. After getting Malu back inside, I hurried down to the garage. She had struggled to stand up. I had her in the service dog vest, and assisted her out to the yard. Although she didn’t conduct any morning business while outside, she was clearly struggling to stay with us. So, since she wasn’t in any apparent pain; and since she drank some water, wagged her tail happily, and kissed us vigorously; we decided it wasn’t yet time to say our final goodbye. October 20: Now it is the next morning, Friday October 20, and it looks pretty much like yesterday morning. So far she has been unable to stand up, but is resting comfortably. She lifts her head up, and then quickly sets it back down again on the raised edge of her bed. We are hoping that, after she gets some more sleep, she will regain her strength enough to be able to get up and, with our assistance, walk outside for a short while. She seemed a little stronger last night than she had the night before. She also drank a lot of water and ate quite a bit, perhaps inspired by the seafood curry we mixed in with her food. About 9:30 A.M. she stood up and wanted to go outside. Like yesterday, we supported her with the service dog vest. She was unable to conduct any morning business, and weakened quickly, so we ushered her back to her comfy, memory foam mattress. We helped her outside every two or three hours, but she was not in a business mood today. By about 9:30 P.M., she had still neither urinated nor deficated, had only taken one drink of water, and had been uninterested in her food. With Malu in a body harness, we let them sniff each other and interact, but even this did not stimulate her appetite today. She had seemed just a little bit more energized and vigorous to me, but her lack of interest in food and water, and inability to relieve herself, were growing concerns. October 21: This morning, at about 6 A.M., she was already standing up to greet us when we went to check on her. We took her outside, again supporting her in her vest, and she walked around in the yard for a while. She was eager to connect, to nuzzle, to be petted; she was clearly seeking comfort and love; but she was still unable to conduct any morning business. She seemed, to me, a little more energized, but her poor lower back was sagging pretty low, and she couldn’t stand for very long without needing to either sit or lie down to rest. So we took her back to her doggy bedroom, which had been my computer room, and tucked her into her orthopedic sleeper. This room has gel mats covering those parts of the floor not covered by the bed, so if she took a tumble, she would land gently. In the rest of the garage, we have either carpet, yoga mat runways, or doggy bed fall zones to protect her should she find a way to stumble (which isn’t likely, since we are supporting her as she walks). She, so far, has shown no interest in food or water this morning. Her window is open, through which she can breathe in the sweet island air, smell fragrant gardenias, hear ocean waves, roosters, doves, canaries, and mina birds; and view the sunshine, blue sky, puffy clouds, and jungle foliage in the yard. She drank water twice today, consumed two little pieces of sausage with her pills, but ate none of her food, and didn’t pee or conduct any business outside. She did urinate, at least twice, in her bed. She also nibbled on some fresh, juvenile bamboo leaves. So she hasn’t had a bowel movement since Thursday morning, and hasn’t eaten any of her regular dog food since Thursday night. So we started googling doggy stool softeners, not wanting her to go too long without having a successful business trip. Pure canned pumpkin, mixed in with meals, was the leading candidate for the job. Since we didn’t have any, I decided to rely on my alternative medicine knowledge and intuition. Magnesium helps relieve inflammation and muscle pain, and also can cause diarrhea in dogs. Large amounts of vitamin C are super-healing, and can also cause diarrhea. So I began adding an additional 1000 mg. dose of ascorbic acid vitamin C, 3-4 doses of lipisomal vitamin C (administered via dropper syringe in the back of her mouth), and some calcium-magnesium; to her other supplements. We confirmed that they were safe for dogs before administering them. October 22: And a beautiful, sunny, good Sunday morning it was; at our lovely Hawaii home, where the rainforest meets the sea. So we decided to have a “picnic” in the yard for Leʻa! We carried out one of the yoga mats, some food and water, and two large mugs of steaming black coffee. We placed everything under some sweet Areka palms in one of her favorite spots in the yard. After giving her her medication and supplements, we assisted her out to the picnic. We turned on KAPA Radio FM to add to the island-style relaxation. One of my theories was that she was having to struggle so hard to try to control her muscles and balance that she couldn’t release her bowel or bladder. That and the fact that her lower back was now too weak for her to hold herself in a squatting position to pee or conduct her business (every time she tried to squat, she would just fall on down into a sitting position). So we wanted to help her relax in the beauty of the day, and then support her lower back if she tried to stand up to do anything. Our little sweetie girl seemed happy and comfortable, lying on her side on the yoga mat. After a few minutes, she took a big drink of water. About a half hour later she suddenly tried to stand up, and my wife was able to support her while she released a long stream of that precious liquid gold! Yay! Today she was only able to struggle, with our support, about three or four feet before collapsing from the muscle fatigue. So we kept hanging out at our little “picnic,” and about an hour later something super-exciting happened! She once again quickly tried to stand up, stumbled a few feet to the side, and while my wife was helping her squat without falling, she laid three beautiful golden eggs! This was a huge relief, since she had not conducted any of her entrepreneurial business for three days. Whether it was the extra vitamin C, the magnesium, the relaxed scene, the love; or all of the above; she was able to relieve herself! Double Yay!! We then brought Malu out, in his harness, to join the family “picnic.” He was super-sweet, highly controlled, and seemed to understand. They sniffed each other, wagged their tails, and she was able to continue resting on the yoga mat the whole time. After about three and a half hours we decided to assist her back to her doggy bed, in the small little room, to get some rest. We had to both help support her weight as she moved from the yard back into her apartment bedroom. She did not eat at all today, and was clearly weaker than yesterday. But we were super-excited that she was able to relieve herself. It seems like every little thing that goes well generates bursts of hope, and sometimes makes it hard to keep the broader perspective in balance. We spent about two more hours with her in the yard during the late afternoon and early evening, but it was lightly sprinkling, and she did not move from her yoga mat in the yard. She seemed happy and comfortable hanging out with her pack in nature. October 23: Since yesterday’s picnic worked so well, we decided to do it as often as we were able. So we got set up for another sweet “picnic” with Leʻa! Today she was noticeably weaker, and could only move about one or two feet before her muscles gave out. So, little by little, we helped her out to her favorite spot beneath the palms. Once we got there, at around 9:15 A.M., she did not get up for hours. She could lift her head up occasionally, and then it dropped back down; but could not stand, did not drink, did not eat, and could not relieve herself. My wife and I discussed it, and thought this might be the day to compassionately support her spirit ascension. I called another vet’s office, and they said it sounded like it to them too. They texted me the name and phone number of a lady vet that comes to people’s houses who could assist with the euthanasia. I called her and scheduled it for 3:30 P.M. We had now had about five more precious days with our baby girl since the last time we thought we needed to put her down, and this really seemed to help prepare us for it. Talk about tears! This is an amazing being who has offered nothing but love, loyalty, joy, humor, protection, and so much more! She has cared for us, and her husband Malu, with the unconditional, unencumbered love that many humans are incapable of. She deserves only the very best — even when it means saying goodbye! Six hours later she had still not gotten up from the mat. About 2 P.M. I noticed that I was starting to count down the time. This was how long we had before our little love bear would leave her physical body and join the spirit animals in and around us. I felt an interesting mixture of joy, relief, and sadness — mostly joy! She deserved to be able to leave this body before starting to suffer. It felt wonderful to be able to offer her this gift, and also to know that this would just be the beginning of a new and bigger adventure for her. The last thing we wanted to do was cause her to suffer for our selfishness. Promptly at 3:30 I heard a diesel truck pull up outside of our large, arched wooden gate. Leʻa heard it too. When I went to the gate to let her in, Leʻa, for the first time in more than six hours, stood up to bark and protect us from this intruder. In walked a kind, professional, and highly compassionate soul. She saw Leʻa standing up, and understood how dogs, even on their death bed, can temporarily pull it together at times like these. She watched her stumbling around, and began examining her. She asked us what treatments the other two vets had recommended. She then suggested something that placed a rug back under our hopes. She said, with her comforting Polish accent, that such neurological injuries are to be treated immediately and aggressively with steroidal anti-inflammatories and muscle relaxants for at least a week before switching to a non-steroidal medication like Previcox. She was super sweet with Leʻa, caressing her, calling her “Honey Girl,” and showing her love. She said that, because of Lea’s relatively young age, the strength she had in her front legs and shoulders, and the fact that she had not yet been given any medication that would relieve the compression around the spinal cord or relax the muscles; she wanted to try this first and see if she would recover. She also asked me to get the x-rays so she could review them, and possibly have them sent to Board Certified radiologists for their opinion. Everything she said was consistent with what the experts had written (when we researched the condition on line). Although it was another big and sudden adjustment, it was a joyful one, and we decided to give it a try. We had prepared ourselves again for letting our sweet baby girl go, and now we didn’t have to — at least for now. She gave us three medications; Secralfate (1 g.), to be taken 20 minutes prior to the other two to coat the stomach; Methocarbamol (500 mg., two tablets every 12 hours), a muscle relaxant; and Prednisone (10 mg, four tablets every 12 hours to start), a steroidal anti-inflammatory. She recommended dietary changes, that were also in alignment with what the specialists had suggested. She gave us nutritional paste to rub on Leʻa’s gums, mouth, etc. to start getting some nutrients in her. She recommended additional electrolytes (e.g. Pedialyte) to replenish and energize. She also recommended raw local honey as a source of nutrition and fiber. She checked out the quarters we had set up for Leʻa, and made some helpful suggestions. In addition to the service dog vest to support her front end, she recommended that we put a sling around her lower abdomen to support her south side as well. She said it could be a rolled up beach towel, wrapped around underneath, with the two ends above her back. We practiced this before she left, to make sure we knew how to do it right. The sling was needed to help insure that her back feet did not drag when she walked (for a variety of reasons). So we started putting her promising prescriptions into practice.